On this date in 1934, in the coda to Hitler’s Night of the Long Knives purge of the Nazi party, the emerging dictator had his longtime ally shot. 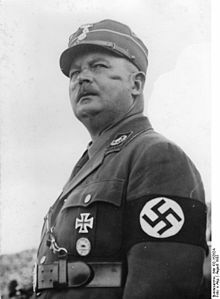 Bavarian World War I veteran Ernst Röhm (Roehm) had been a National Socialist brawler of the earliest vintage: after the armistice, he was among the Freikorps paramilitaries to topple the short-lived Munich Soviet. He joined the NSDAP’s predecessor, the German Workers’ Party, before Hitler himself, and he stood trial with the future Fuhrer after helping Hitler attempt the Beer Hall Putsch. They were so tight, Hitler politely ignored Röhm’s open homosexuality. But most importantly, Röhm was the energetic organizer of the Sturmabteilung, or SA — the party’s private army ready at arms for street battles with Communists, roughing up Jews, Praetorian Guard duty for party brass, and various and sundry other unpleasantries. 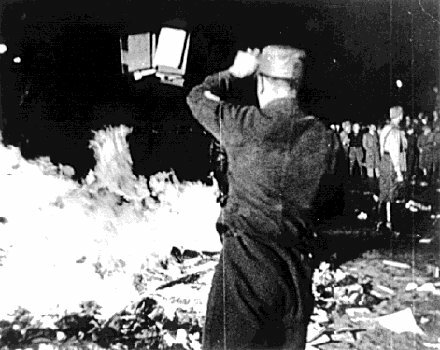 An SA brownshirt tosses a book on the pyre at a May 10, 1933 book burning. Röhm grew the SA like a weed. At well over 4 million men by the time of Hitler’s Chancellorship, it greatly outnumbered the army itself. This gave Röhm personal designs on absorbing the army into his paramilitary instead of the other way around, and it gave Röhm the literal boots on the ground to manifest his own commitment to the “Socialist” bits of the “National Socialist” project. His noises about the “second revolution” to come after the Nazis had already obtained state power were most unwelcome. Well, those gentlemen weren’t about to wait around to be changed in an ungentle manner. Hitler was induced to sacrifice the man who raised him to power in favor of those who could keep him there, personally arrested his old friend and aide-de-camp as the June 30 purge got underway. A sucker for nostalgia, Hitler didn’t have Röhm killed outright — the fate of many others in those terrible hours — but instead shipped him to Stadelheim Prison in Munich. * After due consideration, though, the treacherous chancellor did what he was always going to do. Alan Bullock, in Hitler: A Study in Tyranny, described the final scene. A nice twist of the Long Knife by its wielders: they justified the purge on the grounds of an imminent coup attempt by the dead SA boss,** branding the murders of Röhm and his comrades … the Röhm-putsch. * The same prison where the White Rose resistance members were later executed. ** Reinhard Heydrich supplied a dossier implausibly alleging Röhm was on the take from the French.